A blog about anything RV. RV's for sale, repairing RV's, selling RV's, places to go RV, even funny looking RV's. Boondocking or Dry Camping is when you camp in your RV without sewer, water or power connections. You should start out with a full fresh water tank and empty holding tanks. The fresh water capacity will normally not exceed your black and grey water capacity. The challenging part is maintaining battery power. If you carefully conserve power a single battery can last 2 to 3 days. If its cold and the furnace is needed this can cut you down to less than a day. There are a few options available to extend your batteries life like LED light bulbs, Solar charging systems, Generators or a Battery upgrade. LED light bulbs are 75% more efficient than incandescent bulbs. A Solar charging system will provide a charge even on a cloudy day. A Generator will allow for battery re-charging and full 110 power for air conditioning, microwave or even a plug in hair dryer. A battery upgrade could involve two 12 volt batteries wired in parallel or two 6 volt batteries wired in series. It is important to not let your battery fully discharge when boondocking because it is difficult to bring it back. I recommend charging your battery each day to maintain it. This can be done by plugging your trailer into a properly wired tow vehicle and running the engine. In a motorhome, starting the engine will charge the house battery as well. Dry camping can be a challenge, but camping off the grid can be quite rewarding. The number one thing to watch out for on used Recreational Vehicles is water damage or leak issues. Water damage in RV units is very costly to repair and can be difficult to detect. We see many RV buyers getting caught up in floor plans and upholstery colours that they lose site of this fact. We find that many of the units available privately have been sitting and ignored for some time and this is the reason they are put up for sale. The current owner is not using it any longer and has lost interest in it. Most of the seasoned RV’ers that use their unit frequently rarely have their unit for sale. They usually will trade theirs in for their next unit. People that are unfamiliar with RV’s should have a reliable technician inspect a unit before they purchase it. Did you know it is recommended to have a RV’s seals inspected two times a year. Leak issues aside there are many other things to consider when purchasing a used RV. A good look into the 12 volt system. Are the batteries good? Is the system charging? Do the propane appliances work? Are they up to current propane codes? Has the propane system been certified? Have the wheel bearings and brakes been checked? It is not unusual for a RV Dealership to spend $1500 servicing a used travel trailer and $2500 for a motor home. Despite the weather its shaping up to be great season here at Hub City RV. Re-pack wheel bearings single axle $169.00 and $269.00 for tandem axle. Includes grease and axle seals. Dinghy (or Toad) – Vehicle towed behind your motor home. Basement – Storage area beneath the floor of the motor home, usually accessible from the outside. Dump Station – Facility where you can empty your black and gray water holding tanks. Full Hookup – Campsite with direct connections to electricity, sewer and water amenities. Diesel Pusher – Motorhome with the diesel engine mounted in the rear of the vehicle. Full Timers – People who live in their RV full time. Snowbirds – Those who travel south during the winter months. Equalizing Hitch- A hitch that utilizes spring bars that are placed under tension to distribute a portion of the trailer’s hitch weight to the tow vehicle’s front axle and the trailer’s axles. This hitch is also known as a weight distributing hitch. Dry Weight- The weight of the RV without any fuel, freshwater, propane or passengers. Dry Camping- Also known as boon docking, dry camping refers to camping without any hook-ups. It is namely camping without hooking up to any electric, sewer or water facilities. You can still have electric from your RV batteries and water from your freshwater holding tank. Delam- A shorten word for delaminating. Delaminating is a condition found on a fiberglass RV where the fiberglass skin of the RV separates from the body of the RV. This is usually the result of an undetected water leak, which over time, causes the luan backer that the fiberglass is bonded with to rot. When this backer rots, there is nothing to hold the fiberglass to the body of the RV and this is where you will notice the delam bubbles on the outside walls of the RV. Honey Wagon- Euphemism for the sewage pumping truck. Honey wagons are used to empty RV holding tanks in places where full hookups and dump stations are not available. Inverter- An electrical device for converting 12-volt DC power into 120-volt AC power. Puller- The slang term for a motorhome with a front-mounted diesel engine. Shore Power- Electricity provided to the RV by an external source other than the RV batteries. Slide In- The term for a type of camper that mounts on a truck bed, because this type of camper slides into the truck bed. Tow Bar- A bar used for connecting a towed vehicle to the motorhome for towing with all four wheels on the ground. House Batteries– Batteries used exclusively to power DC appliances and lights in a RV. Self Contained– RV having kitchen, sleeping, potable water and sewage retaining equipment as a minimum. Bathing, heating/cooling and electrical are often essential components of fully self contained vehicles. If you hear of any I have missed let me know and I will add them. In the winter many of our customers want to cover their RV units to avoid leak issues. This is a great idea especially here on the Wet Coast, I mean West Coast. The West Coast is known to develop a little rain and snow from time to time. Alot of people cover their units with a tarp. Now this is a good idea provided an air-space is left between the RV's roof and the tarp. This will allow air circulation and prevent condensation. Wrapping your RV up tight with a tarp will usually cause more condensation damage than the leaks it may prevent. Another option is a custom fit RV Storage Cover. These covers are designed to envelope the entire unit. The material used is called Polypropylene. This material is rugged, water repellent and still breaths to let out vapour and condensation. And if you the cover when your your unit is clean, its still clean when you take it off. Not covered in black streaks, pine needles and moss. 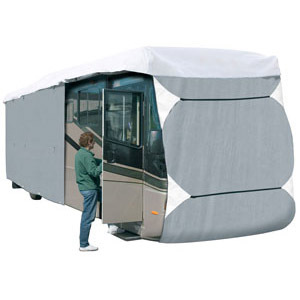 We can get these covers for most Motorhomes, Travel Trailers, Fifth Wheels, Campers and Toy Haulers. Want a quote click here to contact us. ﻿﻿﻿﻿﻿﻿﻿﻿﻿﻿There are a number of things you must do to ensure your black water holding tank functions as it should. One of the biggest mistakes that is made is leaving the black water tank gate valve open when set up in a park with full service. This is OK for the grey water tank as it will flow, because its sink and shower water. If the black water tank valve is left open the fluids will run and the solids will stay causing a mountain of you know what in the tank. This will eventually lead to a clog in the black water holding tank and it is challenging to find someone to fix this. 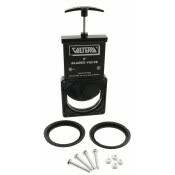 The proper method of using the black water tank is to keep the valve closed while in use. Use RV toilet waste digester to break down the solids and control any odors. Drain the black water tank when it is at least half full or more. It is a good idea to close the black water tank valve after draining and flush with clean water and drain again. Once the tank is drained and flushed, we put about a gallon of water and 2 ounces of waste digester down the the toilet. You are now ready for your next trip. 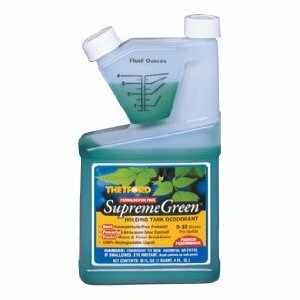 There are many waste digesting products available. Some are liquid, some are powder and some are tablets. Most are very effective if used as directed. What is the deal with truck camper weights? What's the deal with Truck Camper Jacks?